Henry Lloyd lived a remarkably diverse life as a soldier, writer, diplomat, military theorist, and spy. Few men in the 18th century lived a life as varied and unpredictable as that of Henry Lloyd. Writer, rebel, warrior, diplomat, military theorist, and spy, Lloyd was a quintessential maverick and soldier of fortune. His ever-restless spirit carried him from one end of Europe to the other in the service of a diverse collection of royal sponsors and good—and sometimes bad—causes. Lloyd’s origins were decidedly modest. He was born at a remote farmhouse at Cwmbychan, in the north Wales parish of Llanbedr, Merionethshire, sometime around 1720. Since parish registers only extend as far back as 1745, the exact date of his birth is not clear. His father John was an Anglican clergyman, and although Henry dreamed of a military career from a very young age, he lacked the money needed to purchase a commission in the British Army. Instead, as soon as he came of age, he was sent off to Oxford on the assumption he would one day follow in his father’s footsteps. The sudden death of John Lloyd shattered these plans, however. When his widowed mother took a new husband, who turned out to be the tutor who had schooled him as a child, Henry abandoned Wales in protest. However bitter Lloyd’s split with his family, it had the positive effect of liberating him for a life of far-flung adventure. The young Welshman immediately headed for the Continent. In Berlin he enjoyed an ill-advised dalliance with a ballerina before the pressure of his high-flying lifestyle, and the creditors who subsidized it, pushed him south across the Alps. In Venice he found an unlikely ally in the Jesuits, the so-called foot soldiers of the Pope, who rescued him from his creditors and settled his debts. Why they did so is a mystery, but it cannot be a coincidence that they immediately sent young Lloyd to a college in Rome that catered to English expatriates. His intellectual potential was already apparent, and the Jesuits were famed both for their interest in education and for cultivating men who might prove useful allies in the future. Lloyd fulfilled his end of the bargain by dedicating himself to study—at least for a time. His scholastic promise eventually led to his introduction to a Spanish ambassador, who found him sufficiently charming to merit a position in his household. This, in turn, took Lloyd to Barcelona with a recommendation to the Marquis La Mina, one of Spain’s finest soldiers, who was then serving as governor of Catalonia. In the service of La Mina, Lloyd realized his lifelong ambition to become a soldier. Assigned to a corps of military engineers, he threw himself wholeheartedly into the study of tactics, artillery, and fortifications. Despite the enthusiasm he showed for his new duties, Lloyd’s sojourn in Barcelona did not last long. By 1744 he was in France, having attached himself to a monastery where he spent his days not in prayer, but in teaching geography and military engineering to Scottish and Irish officers serving in the French Army. Such Jacobite exiles, the sworn enemies of the Hanoverian dynasty that now reigned in London, were the by-product of the Glorious Revolution that had swept the Stuart dynasty from England half a century earlier. Thus far, Lloyd’s experience of war had been limited to the realm of textbooks and classrooms, but under the influence of his new Jacobite connection, this was about to change. 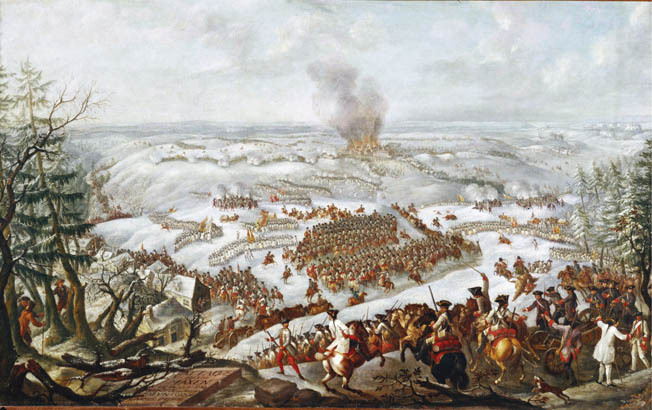 He received his first taste of combat at the Battle of Fontenoy, on May 11, 1745, where the French Army, including a brigade of Jacobites, faced a mixed Anglo-Hanoverian, Dutch, and Austrian force commanded by the British Duke of Cumberland. Lloyd’s insightful sketches of the countryside around Fontenoy attracted the notice of the French Army’s chief engineer, who obtained permission from Marshal Maurice de Saxe for Lloyd to serve as a mounted draftsman, with the modest rank of sub-ensign. After Fontenoy, Lloyd joined the nucleus of soldiers preparing to accompany Charles Stuart, the Young Pretender, to Scotland. Although Lloyd’s role in the Jacobite Rising of 1745-1746 would be comparatively minor, it featured no lack of personal drama. Appointed third engineer and bearing the rank of captain with a commission from Bonnie Prince Charlie himself, Lloyd was aboard the man-of-war Elizabeth during the vessel’s celebrated engagement with HMS Lion on July 9, 1745, and he sustained a severe wound to his right shoulder. Elizabeth eluded capture, but she was too badly damaged to proceed to Scotland, leaving Lloyd and several other officers temporarily stranded in France until alternative transport could be arranged. Lloyd managed to make it to Scotland in time to see the Young Pretender reach Carlisle, but their paths diverged again. Lloyd was sent off alone, in the guise of a wandering cleric, to contact friends of the pretender in northern Wales, where a rising against the government was thought to be imminent. When the anticipated rising failed to materialize, Lloyd proceeded to the next phase of his mission: a secret survey of the harbor towns of Milford Haven, Bridgwater and Barnstaple; the approaches to the major naval base at Plymouth; and the entire Kentish coast from Dover to London. All this was undertaken with an eye to the invasion force massing in support of Charles on the other side of the English Channel. The Young Pretender’s defeat at the Battle of Culloden in April 1746 rendered Lloyd’s surveying efforts futile, and although he proved adept at covering his tracks, his activities finally aroused the suspicion of the authorities. He was arrested in London, but he managed to conceal the full extent of his links to the Jacobites. Through the timely intervention of his aristocratic Scottish friend (and fellow Jacobite) John Drummond, Lloyd was soon released, allowing him to return to France and a new commission in the French Army. He went on to distinguish himself as an engineer in Saxe’s brilliant 1747 campaign against the allied Dutch, British, and Austrian armies in the Netherlands. The skill with which Lloyd selected positions for the artillery and directed the excavation of trenches at the siege of Bergen op Zoom won him particular acclaim. By 1754, with another continental war brewing and Paris abuzz with schemes to invade England, Lloyd was assigned by Marshal de Belleisle, the French minister of war and the chief advocate of a French strike across the Channel, to survey the British coast. Lloyd’s subsequent report, which was distinctly pessimistic about the chances of any invasion succeeding, effectively put an end to such invasion planning. Lloyd resumed his wandering life on the Continent, and the eruption of the Seven Years’ War in 1756 proved a great boon to his ambitions. In late 1758, he obtained a commission as aide-de-camp to Franz Moritz von Lacy, chief of staff to Field Marshal Daun, who commanded the Austrian Army in Saxony. Following Daun’s destruction of an entire Prussian corps of 15,000 men at the Battle of Maxen in November 1759, Lloyd was promoted to the rank of captain and given command of a company of light infantry. In early 1760, he took command of a mixed force of foot and horse that dogged the opposing Prussian Army in virtually all its movements. Lloyd’s unflinching loyalty to Lacy and his inability to hold his tongue against Lacy’s enemies within the army led him to a characteristically dramatic decision. He resigned his Austrian commission and abandoned the field, going over to Duke Charles of Brunswick, Frederick’s most important German ally. Lloyd witnessed the final campaigns of the Seven Years’ War from the Anglo-Prussian side. His new commander was Ferdinand of Brunswick, Duke Charles’s brother, who led allied armies against the forces of France and Austria in the Rhineland. Serving with Ferdinand inevitably put Lloyd in contact with influential British officers stationed in Germany, such as John Manners, the Marquess of Granby and subsequently commander in chief of the British Army; and Henry Clinton, an equally fine soldier destined to earn fame as commander in chief of British North America in the Revolutionary War. It took time for the value of these new contacts to become apparent, however. In the immediate aftermath of the Seven Years’ War, Lloyd remained in Germany without a reliable income. Facing the specter of poverty, he sought employment from whatever army would have him. Lloyd’s fortunes improved with his involvement in the negotiations that preceded the 1764 marriage of Charles’s son and heir, Ferdinand, to Augusta, the sister of King George III of Britain. Tact never having been one of his strong points, Lloyd made an unlikely diplomat, but he rose to the occasion and served both courts well. In return, he was honored with a pension from Duke Charles and another from the British government. From then on, his loyalty to the House of Hanover was never in doubt. By then, Lloyd had discovered a new passion. With the long years of war at least temporarily concluded, he set about composing books and pamphlets to communicate to a wider audience the lessons he had learned on the battlefield. His Memoir on the Present State of Portugal, completed in 1765, was addressed specifically to Count William von Schaumburg-Lippe, who had recently returned home to Germany after a period of spectacular service in the Portuguese Army, and from whom Lloyd undoubtedly hoped to win a recommendation for a job. His next book, published in 1766 and drawing directly on his experiences fighting on both sides of the Seven Years’ War, was The History of the Late War in Germany. From its first page, he could not resist the temptation to insult other military theorists. “Men of learning,” he sniffed, were “utterly unacquainted with the nature of military operations.” His criticisms of Frederick the Great ensured the book a wide circulation. During a period in which Frederick’s military genius was hardly questioned, it came as a shock to many people, especially in Germany, when Lloyd condemned the Prussian for failing to launch a preemptive attack on enemies obviously gathering against him in 1755, for refusing to press quickly into Austrian Bohemia after overrunning Saxony in 1756, and for too often resorting to the same tired tactics in his battles even when it was obvious that his Russian and Austrian opponents were no longer surprised by them. Having finally made his peace with the British government by the late 1760s, Lloyd was happy enough to put his talent for subterfuge at its disposal. He appeared in Lombardy in early 1768, just as the island of Corsica was on the verge of being transferred from Genoese to French control. Under the leadership of the wily and charismatic Pasquale Paoli, Corsica had been in open revolt against Genoa since 1755, but it was unlikely to avoid occupation by the French unless it received substantial aid from another major European state. Great Britain, the dominant naval power in the area, was not keen to see the French gain a base in the western Mediterranean and preferred to see Corsica remain beyond their reach. Insofar as the rebels were to be offered any official English support, it would be limited to money alone, distributed through ostensibly private channels. This was the mission on which Lloyd departed England in late 1767. Lloyd was careful not to reveal his official backing, and his erratic movements around northern Italy, which took him to Genoa, Livorno, Florence, Parmi, and Milan, were sufficient to confuse even close friends. When the fighting in Corsica heated up during the summer of 1768, his focus became clearer. It did not take Lloyd long to lose confidence in the conduct of the Corsican patriots, who, for all their spirit, could not hope to match the professional soldiery of France in a conventional battle. He concluded that the Corsicans’ only hope lay in embracing the very style of warfare he had urged on Schaumburg-Lippe and the Portuguese a few years earlier: a war of small, fast-moving detachments and brief, well-coordinated encounters, relying heavily on surprise to cripple the invader by denying him resupply. Desiring a closer look at the situation, Lloyd adopted an alias and boarded a Danish merchant vessel headed for Corsica. For once, his luck deserted him. He was picked up at sea by the French, who sent him back to Tuscany. Stymied in his effort to observe the Corsicans directly, Lloyd raised several thousand pounds for Paoli’s cause from resident Englishmen in Tuscany. He remained in northwestern Italy through the following spring, maintaining a discreet watch on events, until he was recalled to London for consultations with Lord Granby in March 1769. Lloyd returned to Italy later that year, but could do nothing to save Corsica from its fate. The patriots were crushed at the Battle of Ponte-Nuovo in May 1769. Lloyd returned to writing, publishing his cautionary Essay on the English Constitution in 1770. Yet the warrior-adventurer strain in his character could not be suppressed indefinitely. In 1772, he secured an audience with Catherine the Great of Russia, a sovereign well known for her willingness to employ foreign-born officers. He was soon taken into her service with the rank of major general and played an active part in the Russian Army’s push south across the Danube. At the Battle of Silistra, his division bottled up the fortress and repulsed a series of furious Turkish counterattacks. The campaign took a severe toll on Lloyd’s body, and he contracted an illness sufficiently serious to keep him laid up in Warsaw for the rest of 1774. In the meantime, Catherine was already planning her next war, with Swedish King Gustavus III as the intended target. It is a measure of Lloyd’s stature that the empress was ready to entrust him with command of the 30,000-strong army as soon as hostilities should commence. After the war was postponed, Lloyd’s role in Catherine’ís service became progressively more precarious. Convinced that his days of prosperity in Russia were numbered, Lloyd returned to London. After the death of his wife Mary in 1778, he relocated to the Continent, taking a modest house at Huy, Belgium. By then, Great Britain’s fight with its rebellious American colonies had escalated into a wider war involving France, and Lloyd visited Gibraltar just before the beginning of the Franco-Spanish siege in 1779. He had chanced to meet George Elliott, the governor of Gibraltar, during the Seven Years’ War, and he treated Elliott to a full measure of advice on how to strengthen the Rock’s defenses. Outnumbered almost two-to-one by a Franco-Spanish armada of 66 battleships, the Royal Navy’s Channel Fleet spent the summer in retreat, withdrawing farther and farther eastward up the English Channel. Meanwhile, on shore, there were no more than 60,000 soldiers to guard the entire island. Of these, at least half were ill-equipped and poorly trained militiamen who had virtually no combat experience. Lloyd could not resist the lure of crisis. 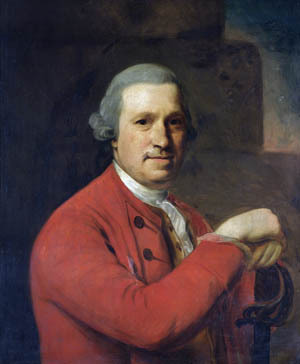 He reported to Charles Jenkinson, the secretary of war in Lord North’s government, who was sufficiently impressed to brief his colleagues and King George on Lloyd’s advice. Lloyd advocated an alliance with his old employer, Catherine the Great, whose support might provide Great Britain with a new and sorely needed reservoir of foreign mercenaries. Lloyd also sent a paper to the British commander in chief, Lord Amherst, containing a frank assessment of the state of the coastal defenses in the west of England. Traveling in secret, he had visited a number of places, including the great naval arsenals of Portsmouth and Plymouth, which he deemed likely targets of a French attack. Prussian forces in combat against Austrian forces at the Battle of Maxen, Saxony, on 21 November 1759, during the Seven Years War. By September, the immediate invasion crisis had passed. The enemy fleet, crippled by disease, withdrew to its bases without a fight. But the aftertaste of panic lingered in southern England, and Lloyd’s desire to communicate what he had learned from his survey of the coast remained strong. The result was A Rhapsody on the Present System of French Politics, on the Projected Invasion, and the Means to Defeat It, arguably the most famous of all his books. Imbued with the spirit of unblinking honesty that was the hallmark of Lloyd’s writing, the work was a meticulously detailed and frequently critical assessment of the fortifications and garrisons that could expect to take the brunt of any French landing. After submitting an advance copy to Lord Amherst, Lloyd agreed not to publish it in return for a lump payment of 500 pounds. A few copies survived, however, and made their way into the marketplace, to great acclaim in England and other countries. In the aftermath of the aborted publication of Rhapsody, Lloyd returned to the Continent. He spent the balance of his life at Huy, occupied with literary endeavors. His last book, a continuation of his history of the Seven Years’ War in Germany, was published in 1781. Still, he never gave up hope of receiving one more call to arms. In late 1780, Lloyd nearly won command of the American Loyalists serving in the army of his old friend (and now lieutenant general) Clinton, but Lord Amherst, perhaps still smarting from earlier criticisms, vetoed the idea. Lloyd died on June 9, 1783, having served many different causes and many different rulers. He had journeyed far from an obscure village in northern Wales to the halls of power in France, Germany, Italy, Spain, Portugal, and Russia. He almost made it to America, where his talents might have been put to good use by the occupying British Army and its minions. But that was one journey he never made—probably much to the benefit of the American Founding Fathers. Tags American Revolution, Battle of Culloden, Battle of Fontenoy, Battle of Ponte-Nuovo, Battle of Silistra, Bonnie Prince Charlie, British Army, British Royal Navy, Catherine the Great, Duke Charles of Brunswick, Duke of Cumberland, Ferdinand of Brunswick, Field Marshal Daun, Franz Moritz von Lacy, Glorious Revolution, Henry Clinton, Henry Lloyd, HMS Lion, Jacobite, Jacobite Rising of 1745-1746, Jesuit, John Manners, Marshal de Belleisle, Pasquale Paoli, Revolution of 1688, Seven Years War, Siege of Bergen op Zoom.